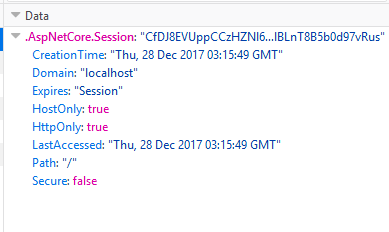 If you ever used TempData in ASP.NET MVC, you are probably aware that by default TempData is stored in Session state. 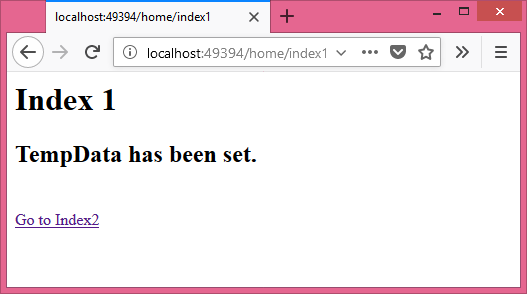 This means the web application must have sessions enabled. Luckily, ASP.NET Core 2.0 provides two TempData providers - Cookie based and Session State based. 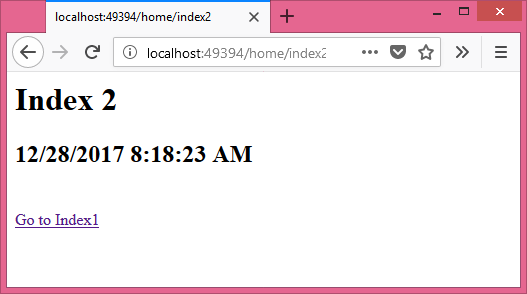 To that end this article shows how to use both of them in an ASP.NET Core application. If you are unfamiliar with TempData dictionary consider reading this and this first. The data being stored in TempData is small in size. Web application is part of web farm and you don't want sticky sessions. The above code shows two actions - Index1 and Index2 - of HomeController. The Index1() action stores a date-time stamp in TempData dictionary with a key name of message. The Index1 view simply offers a hyperlink to navigate to Home/Index2. The Index2() action returns Index2 view. The Index2 view reads TempData and shows the value of message to the user. As you can see, the Razor code checks whether message has been stored in TempData or not. It does so using the Peek() method of TempData. Since we use Peek() the key won't be removed from TempData. Accordingly a message is displayed in the browser informing the status of message key. An anchor tag helper renders a hyperlink that points to the Index2() action of HomeController. When user clicks on the hyperlink rendered by Index1. The value of message is outputted in the browser. Markup of Index2 is shown below. Index2 simply reads the TempData dictionary and outputs the date-time stamp value in the browser. A hyperlink allows the user to go back to Index1. The following figure shows a sample run of Index2. How do we know that TempData is really using cookies. Run the application with F12 tools and locate the cookies option. The following figure (FireFox) shows the cookie used by TempData for storing the values. The cookie value is Base64 encoded. As you might have guessed, since a cookies are being used to store TempData all the limitations of cookie storage apply (browser support, size etc.). Let's now see how to use Session State based TempData instead of cookie based. The ConfigureServices() calls AddSessionStateTempDataProvider() to switch the default TempData provider to SessionStateTempDataProvider. It also calls AddSession() to enable in-memory session state for the application. The Configure() calls UseSession() to use the session state middleware. Session state based TempData can come handy when your application is already using session state for other purposes. Also, if you intend to store bigger chunks of data in TempData cookie based storage might not serve the purpose and you may want to switch to session based TempData. To read more about TempData and TempData providers go here. That's it for now ! Keep coding ! !